CLEARFIELD – April is National Child Abuse Prevention month. In recognition, staff at the Child Advocacy Center of Clearfield County (CAC-CC) has partnered with local individuals and organizations to help raise awareness, announced District Attorney William A. Shaw Jr. on Tuesday. According to him, local Girl Scouts Troop No. 41997 has made blue ribbon pins. The pins are being distributed throughout the community in support of National Child Abuse Prevention month. The blue ribbons were hand-made by the Girl Scouts who are striving to earn their Bronze Awards. This award is the highest achievement for a Junior Girl Scout, he said. Shaw added that he is grateful for these young leaders who are spreading awareness of child abuse and working alongside the CAC-CC. He is also grateful to Penn Highlands Clearfield, Clearfield YMCA, CURVES of Clearfield, The Cove Drop-In-Center of DuBois and Beatty’s Rustic Roots Salon for diligent efforts to pass out the blue ribbons. Additionally, he gave credit to many local organizations, which have helped make Child Abuse Prevention month a successful campaign. Shaw specifically named Clearfield County Children, Youth & Family Services, Children’s Aid Society, Cen-Clear, PASSAGES Inc., and the Clearfield County League on Social Services for hosting blue jean, dress-down days at their offices. 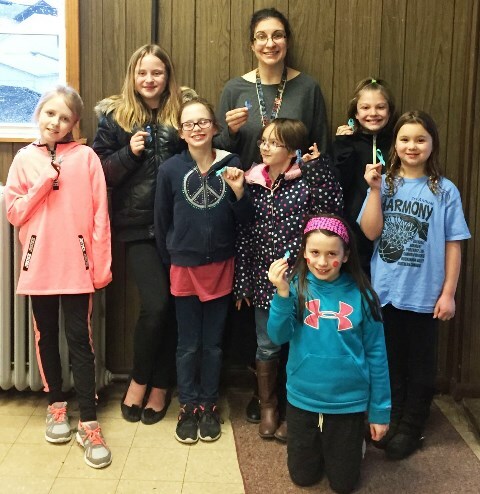 He thanked the Moshannon Valley School District for helping to raise funds and promote awareness by selling pin wheels during the month of April. Others he thanked included the Loyal Order of the Moose No. 327, Lawrence Township Police Department staff, Leyo’s Supermarket of Coalport staff and Herinko Insurance, which made donations to the CAC-CC. “This was the first Child Abuse Prevention awareness campaign that our CAC-CC has implemented, and the community support has been overwhelming. We are looking forward to creating awareness campaigns in the future,” Shaw said.